As far back as I remember, I have had an obsession with food. I would always take seconds, thirds, and even fourths if I could. Then high school came and the withholding of food began. Little did I know that was also an obsession with food. My main obsession was binge eating. I thought of food 24 hours a day seven days a week. I could not pass a fast food place without stopping, sometimes three times within 10 miles. One June evening on my way home from work, I stopped to get a treat like I always did, but this time would be almost fatal. I was so obsessed with my food and I did not see the car in front of me. I slammed on my brakes and kept fish tailing on the highway until I rolled my car over 3 times into the ditch. There I was upside down wondering what happened. I knew that it could not have been my fault. I was in denial. That should have been my first sign. I did a lot of yo yo dieting in my life and it took a toll on my body. My gallbladder was not functioning any more so I had to have surgery to remove it. As I was recuperating and everyone left for work and school, I decided to get something to eat. All of the sudden, I felt a pain so severe, I had to call 911. They took me back to the hospital. I had a bile leak. I went septic and was on the verge of death. It took a long time to recover from that 15 day hospital stay. After my near death experience, I said to myself, “Who cares what I eat, I was almost dead, and I can eat anything I want.” That is when everything spiraled out of control for the last time. I was so depressed. I would not go out in public very much. I just ate every chance that I had. One afternoon, at my lowest point, I was searching the internet about food addiction. I knew there must be someone or some place that could help someone with food as an addiction. That is when I found COR Retreat. I looked at the website and listened to all the videos for over a week. Then I called Michelle. I knew that I had to try this. What else did I have to lose? I was desperate. 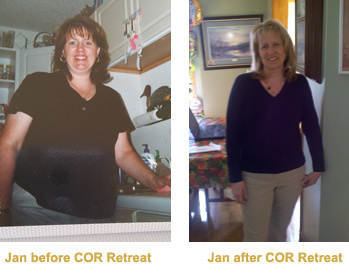 When I arrived at COR Retreat, I was so nervous, but somehow I felt calm. Everyone was so nice. I couldn’t believe that everyone else that was there had the same stories about food that I did. I thought I was the only one who had an obsession of the mind. It made me realize that I truly did have a problem and I was at the right place. I never heard of a 12 step program before I came to COR Retreat, so this was a new concept for me. But I kept hearing to just have an open mind. So, I opened my mind and surrendered my obsession over food. I knew that I was powerless over food. That was the turning point of my life. My relationship with my family is stronger today because I can spend more time thinking about what I am going to do with them not what or where I am going to eat. I no longer have an obsession with food. I follow a 12 step program that helps me every day to see that I have so much more to be grateful for. I did not know how wonderful life could be without the constant thought of food. My mind is free of always thinking about the way I look. It really wasn’t all about the weight after all. It was about me growing spiritually, with my Higher Power leading the way. I try to go back home to COR Retreat every month to meet the new alumni coming into the group and help carry the message of hope for all that still suffer. I pray for all that still suffer from any addictions. May they find peace and serenity within themselves.